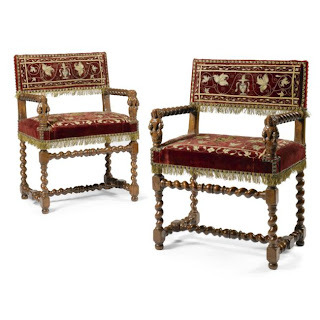 Louis XIII furniture are 1610 to 1643 but his style began around 1600 and ended in 1661. Strong foreign influence from Italy and the Spanish Netherlands. It was not until the death of Mazarin and the reign of Louis XIV staff for the postage to French art style … It has not escaped the baroque, preciousness, glitz accompanied by permanent overload of textiles in interior design. Approvals fashion and seeking comfort (after 1640, the chair arm follows the evolution of the mode). Henri IV in 1596, strengthened and compulsory guilds. 1601: Louvre and many workshops Faubourg St. Marcel. 1608: = carpenters ebony cabinet. Carpenter carpenter named Jean Macé Ebony King in 1641 in ebony cabinet and veneer. Status confirmed turners. Early seventeenth century, the seats have a permanent lining fabric (replacing the tile or movable cushion). 1635-1640: the word chair arm chair is replaced by (cf. faudesteuil, Roman curule seat). 1650: emergence of high back chairs. It has furniture and yard area (Breton …). More firms (see Italy), cabinets. Italian heritage with the addition of valuable components: ebony, ivory, tortoiseshell … legs twisted Hispano-Flemish influences. The chairs are simple upholstered feet. No dining table but table and trestles. The chair has arms but not the chair. After 1640, arm chairs follow the evolution of women’s fashion. Ornamental broad, thick, swollen, geometric, accompanied by dark woods: ebony, walnut and pear possibly blackened (cheaper than ebony). Geometric designs, diamonds, diamond point, cherubs, cornucopia, female busts, allegorical characters, stucco, trompe l’oeil, faux marble, cartridges, subdivision, vase of flowers, still lifes, grotesque, embedded tables, tapestries floating. The decor is engraved and carved reliefs framed moldings showers. Fabrics: Serge de Beauvais, canvas Riom point of Hungary, Italy silks, brocades, silk velvet and wool braids son of gold and silver, various trimmings. Colors: olive green and red. Wood: oak accompanied by walnut. Fir, poplar, alder (white and light wood) sometimes replace the oak veneer support as ebony. Second half of the eighteenth, we discover exotic wood from India (but coming from South America): amaranth, kingwood, rosewood. Cabinetmakers use: ebony, tortoiseshell, ivory, pearl, copper, brass, bronze, inlaid with precious stones, marble mosaics varied. Editing: miter, straight cut with pegged mortise and tenon and Corbin nose in doorways and tray table. Joints tongue and groove panels in embrevés frames are molded on many quality construction. Location: often walnut. Many seats for arm and back seats. Seats and Rosary … filming torso adorned with muzzles, lions and dolls in the armrests. 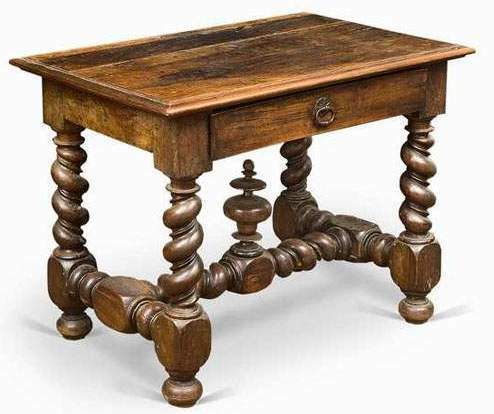 Twisted legs = Hispano-Flemish influences. This entry was posted in FURNITURES on October 29, 2012 by webmaster. Hello there, simply became alert to your blog via Google, and found that it’s truly informative. I am going to be careful for brussels. I will be grateful in case you continue this in future. Numerous other people might be benefited from your writing. Cheers!